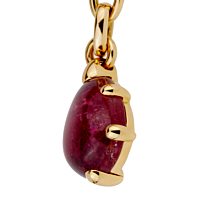 The Pomellato pink tourmaline gold chain necklace features a variety of designs within the finely crafted chain. 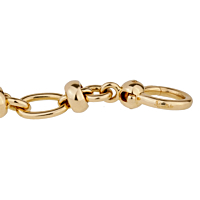 18kt yellow gold large oval links are embellished with smaller yellow gold rings, beads and links. At the center is a deep rose colored pink tourmaline oval cabochon prong set in gold.